Hundreds showed up to testify in Helena against cuts to Medicaid, July 27, 2017. That cut in pay to caregivers is just under 3.5 percent, and is, "a direct result of legislative mandated funding reductions from 2017 legislative session," Hogan says. A bill passed at the end of the session mandated that if state revenues came in significantly under budget, it would trigger progressively steeper spending cuts. New revenue figures have now triggered those at the steepest level, so the health department says it has to cut caregiver pay as a result – there's more on that below. Hundreds of people came to the hearing to comment on the pay cuts. They lined up along a wall and out the door of the health department’s auditorium in Helena to speak against the cuts. No one spoke in favor of them. Michael Coe is the admissions coordinator at The Pines assisted living center in Polson. He says facilities like his already have a hard time keeping staff, and that cuts in Medicaid payments will make that even harder. "Most people have no idea what it’s like to lose staff to a place that can pay more because it’s a fast food place. People care more about their hamburgers than they do about their elderly," Coe says. Several operators of assisted living and home health agencies told the department that Medicaid payments are already so low that they can’t afford to offer wages competitive with those in fast food. "In November of last year, I got a referral for a baby that was failing to thrive, but he was sent to Seattle and brought up to a level where he could return home as long as he had nursing services. We couldn't staff it. Neither could the other providers in the state. November, December, January, February, March, April, May, June this family sat in the hospital with their son unable to go home, with their other son, his twin brother, because there were no nursing services. Not because he required the acute care. And how many Medicaid dollars did that cost the state?" The cuts will also affect people and organizations that care for people with mental illnesses. "My name is Sgt. Jim Anderson. I’m here representing Sheriff Brian Gootkin and the Gallatin County Sheriff's office. These cuts are gonna have a huge impact on those suffering with mental illness, as well as law enforcement and the criminal justice system. It will essentially cripple our local mental health system that is already struggling to stay alive and fighting to do the right thing. The results are going to be an increase in courtroom time, and then long transports to the state hospital. And we know from our history that without local crisis systems we're going to see an increased rate of those suffering from mental illness put in our detention center as well as our prisons. These cuts are ultimately going to cost our taxpayers, local government and the state hospital more money than the proposed cuts are actually going to save. " The 3.5 percent cut in payments to Medicaid caregivers hasn’t been implemented yet. The Department of Health and Human Services says they’re set to go into effect October 1. An interim legislative committee, however, has filed an objection which would push the cuts back until January. The Department says that would mean the cuts would need to be deeper. 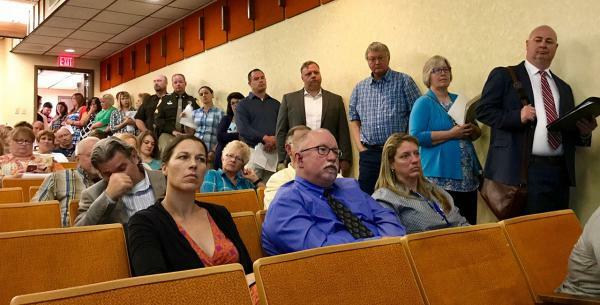 But a lot of the people who testified Thursday questioned whether DPHHS, or state lawmakers could find cost savings elsewhere. Kathy McGowan, has worked for Montana’s community mental health centers since the 1980s. "I’m not blaming DPHHS, they have their marching orders," she says. "I disagree that these are mandatory. They’re before us because we have placed no value on community-based services. We've ignored it. It's basically a sham. When I first started, we had a place at the table, ongoing. There were discussions. They valued our input. There is no place at the table. In fact, we have a really hard time getting any kind of access to information or meetings. We have some really good ideas to change things. That's kind of the way it is. I'm sorry to have to say that, but it's a sham. So we have to gather together and step up and say we are not taking any more." Montana Medicaid Director Marie Matthews talked to reporters about the cuts before Thursday’s hearing. "Absolutely this isn’t a place we want to be, it’s not," she said. Matthews said the Health and Human Services Department is also making significant cuts to its own staff and expenses. "We have reductions across the board. … We’re having to hold positions open, we’re having to eliminate travel to trainings, all of the kinds of savings the agency will do before it cuts provider rates." And Matthews emphasized, cutting payments to health care providers in 2018 and ‘19 is explicitly called for in the legislation state lawmakers passed, and that the governor signed. "The legislature intends that the appropriation reduction -- House Bill 2 is reduced by $3.5 million in 2018, and $3.5 million in 2019 and the Legislature intends that that appropriation be used to reduce Medicaid provider rates"
Back at the hearing, Mike White, the co-owner of Caslen Living Centers in Livingston told the crowd of mostly fellow health care providers and people who use their services, that he recognized the role that state lawmakers and the governor played in the funding cuts. "I wish those knuckleheads were sitting in these seats, not you guys. I feel like I’m speaking to the choir. But those are probably the people that need to hear our comments," White said. 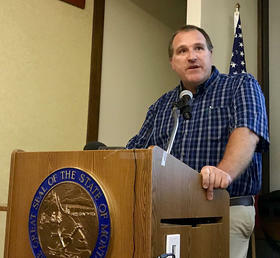 Montana’s Department of Public Health and Human Services is taking public comment on the proposed 3.5 percent cut in to how much it pays healthcare providers through Medicaid. The cuts could take place as soon as October 1. If an objection to them stands, they would be delayed until January, but that would mean deeper cuts, of more than 6 percent. This story was made possible, in part, by a grant from the Montana Healthcare Foundation.